If you wish to save this search for easy future viewing, please click here. Note: only 1 search may be saved at a time. A PRESTIGIOUS FIVE BEDROOM DETACHED PROPERTY SITUATED ON A PRIVATE ROAD IN BOWDON. Fabulous Entrance Hall. Living Room. Breakfast Kitchen with separate Utility. Dining Room. Office. Conservatory. Ground Floor WC. Five Bedrooms. Five Bathrooms. Gated Driveway with Electric Gates. Available NOW. UNFURNISHED. AN AMAZING FIVE BEDROOM DETACHED FAMILY HOME SITUATED IN A POPULAR LOCATION CLOSE TO THE CENTRE OF HALE BARNS AND LOCAL SCHOOLS. Porch. Hall. Large Lounge. Ground Floor WC. Dining Room. Modern Breakfast Kitchen with Sitting Area. Conservatory. Galleried Landing. Double Garage. Five Bedrooms. UNFURNISHED. Available April. AN INCREDIBLE HIGH SPEC DETACHED HOME LOCATED WITHIN WALKING DISTANCE OF HALE VILLAGE WITH EXCELLENT LOCAL SCHOOLS NEARBY. Hall. Lounge. Dining Breakfast Kitchen. Family Room. Ground Floor WC. Utility Room. Three Double Bedrooms. Family Bathroom plus En-suite. FURNISHED. Available NOVEMBER. STUNNING APARTMENT IN MODERN DEVELOPMENT SET IN THE HEART OF HALE VILLAGE. The apartment comprimises of Hall. Lounge. Reception Room. Separate Kitchen. Two Double Bedrooms and Three Bathrooms. Excellent Specification Throughout. Gated Entrance. UNFURNISHED. Available Early May. NEWLY REFURBISHED FOUR DOUBLE BEDROOM DETACHED FAMILY HOME WITHIN WALKING DISTANCE OF HALE VILLAGE. Hall. Large Living Dining Kitchen. Family Room. Office. Utility Room. WC. Four Bedrooms. Two Bathrooms. Garage. Driveway. UNFURNISHED. Available NOW. AN INCREDIBLE SIX BEDROOM SEMI-DETACHED FAMILY HOME LOCATED CLOSE TO THE CENTRE OF HALE VILLAGE WITH MANY EXCELLENT SCHOOLS NEARBY. Hall. Lounge. Dining Room. Breakfast Kitchen. Utility Room. Ground Floor WC. SIX Double Bedrooms. Two Bathrooms. Cellar Chambers plus Garage. Driveway. UNFURNISHED. Available NOW. A SUBSTANTIAL DETACHED FAMILY HOME WHICH ENJOYS A CUL DE SAC LOCATION WITHIN A POPULAR NEIGHBOURHOOD. Porch. Hall. WC. Three Reception Rooms plus Conservatory. Dining Kitchen. Utility/Prep Kitchen. Five Bedrooms. Two Bath/Shower. Ample Parking. Garden. Garage. FURNISHED or UNFURNISHED. Available JULY. A SUPERB FOUR BEDROOM DETACHED FAMILY HOME LOCATED ON A VERY DESIRABLE ROAD IN BOWDON. Porch. Hall. Ground Floor WC. Large Living Kitchen. Dining Room. Family Room. Utility Room. Landing. Four Bedrooms. Family Bathroom. Garage. UNFURNISHED. Available NOW. Minimum 12 month contract. A SUPERB CONTEMPORARY STYLE HOME IDEAL FOR STAMFORD PARK, EXCELLENT SCHOOLS, ALTRINCHAM TOWN CENTRE AND HALE VILLAGE. 1550 sqft. Hall. WC. Lounge. Dining Kitchen. Study Area. Three Bedrooms. Three Baths/Showers. Driveway. Garage. Gardens. FURNISHED. Available Early APRIL. A HIGH SPEC FOUR BEDROOM DETACHED COTTAGE IN A SEMI RURAL LOCATION WITH EXCELLENT TRANSPORT LINKS. Reception Hall. Two Receptions. Breakfast Kitchen. Utility. WC. Three/Four Bedrooms. Study. Sitting Area. Two Bath/Showers. Amazing Garden. Super fast broadband connection. PART FURNISHED. WILL CONSIDER SHORT TERM LETS. Available APRIL. A STYLISH FOUR BEDROOM DETACHED FAMILY HOME IN A FABULOUS LOCATION CLOSE TO ALTRINCHAM TOWN CENTRE. Hall. WC. Large Lounge. Office. Dining Room. Kitchen. Utility. Four Bedrooms. Two Bathrooms. One En suite. Double Garage with shared access driveway. Gardens. UNFURNISHED. Available Mid AUGUST. COMPLETELY REFURBISHED THREE BEDROOM SEMI-DETACHED LOCATED ON A PRIVATE CUL DE SAC ADJACENT TO ALTRINCHAM GRAMMAR SCHOOL AND WITHIN WALKING DISTANCE OF HALE VILLAGE. Hall. Ground Floor WC. Lounge. Dining Kitchen. Utility Room. Three Double Bedrooms. Two Bathrooms. Gardens. Driveway with Carport. UNFURNISHED. Available NOW. A BEAUTIFUL GRADE 2 LISTED GEORGIAN HOUSE WITHIN THE DOWNS CONSERVATION AREA CLOSE TO ALTRINCHAM TOWN CENTRE AND THE METROLINK. Hall. Lounge. Dining Room. Breakfast Kitchen. Utility. WC. Four Bedrooms. Two Bath/Shower Rooms one En Suite. Rear Courtyard. Cellars. UNFURNISHED. Available End of September. EXCELLENT FOUR BED DETACHED FAMILY HOME LOCATED ON A QUIET CUL DE SAC WITH BOWDON CHURCH SCHOOL ON THE DOORSTEP. LOVELY PRIVATE GARDEN. Hall. Downstairs WC. Lounge. Dining Room. Study. Modern Breakfast Kitchen with Utility room. Four Bedroom. Family Bathroom plus En-Suite. UNFURNISHED. Available NOW. A STUNNING FOUR DOUBLE BEDROOM DETACHED FAMILY HOME WITH A LARGE SOUTH FACING GARDEN CLOSE TO EXCELLENT SCHOOLS. Porch. Hall. Downstairs WC. Large Lounge. Dining Room. Two further reception rooms. Breakfast Kitchen. Four Double Bedrooms. Family Bathroom plus En-Suite Shower Room. UNFURNISHED. Available NOW. AN EXCEPTIONAL BAY FRONTED PERIOD TERRACE SET OVER FOUR FLOORS. PARKING TO THE REAR. STYLISHLY APPOINTED THROUGHOUT AND WITHIN WALKING DISTANCE OF HALE AND ALTRINCHAM. Four Double Bedrooms. Two Bath/Shower Rooms. Part Furnished. Available NOW. A RECENTLY UPDATED THREE/FOUR BEDROOM END TERRACE PROPERTY IN THE HEART OF HALE VILLAGE WITH CONVERTED CELLARS. Porch. Lounge. Family Room. Dining Area. Breakfast Kitchen. Study. Playroom.Three Bedrooms. Three Bathrooms. Off Road Parking. Garage. UNFURNISHED. Available NOW. A BEAUTIFULLY PRESENTED, STYLISHLY UPDATED AND IMPROVED THREE BEDROOM VICTORIAN END TERRACED PROPERTY with Cellars & Valuable Off Street Parking, Single Garage And Courtyard To The Rear. UNFURNISHED. Available NOW. A FABULOUS TOWN HOUSE, BEING THE LARGEST DESIGN ON THIS EVER POPULAR DEVELOPMENT. Ideal for Stamford Park and the Town Centre. Hall. WC. Fantastic Open Plan Breakfast Kitchen with Living Area. Utility. Dining Room. First Floor Lounge with French doors. Four Bedrooms Over Two Floors. Two Bath/Shower Rooms, one En-Suite. Parking. Garage. UNFURNISHED. Available November. Sorry, no pets. A SPACIOUS GROUND FLOOR APARTMENT WITH ITS OWN PATIO SET WITHIN THIS VICTORIAN CONVERSION PERFECTLY LOCATED FOR HALE AND ALTRINCHAM. Private Entrance and Hall. Lounge. Dining Kitchen. Two Double Bedrooms. Two En Suites. Parking. Two Garages. Available Now. UNFURNISHED. SPACIOUS FOUR BEDROOM TOWNHOUSE WITHIN A SHORT WALK TO ALTRINCHAM TOWN CENTRE, ALTRINCHAM METROLINK STATION AND THE ARTISAN MARKET. Balcony. Hallway. Utility Room. Two Bathrooms. Modern Kitchen. Living Dining Area. Four Bedrooms. Two Bathrooms. Garden. Garage. Available MID-APRIL. Part Furnished. A SUPERBLY SIZED EXTENDED SEMI DETACHED AT THE HEAD OF A CUL DE SAC, IDEALLY LOCATED FOR STAMFORD PARK AND SCHOOL. Porch. Hall. WC. Three Receptions. Breakfast Kitchen. Utility. Four Bedrooms. Two Baths/Showers. Driveway. Gardens. UNFURNISHED. Available JULY. A STUNNING FOUR BEDROOM DETACHED FAMILY HOME ON A VERY POPULAR DEVELOPMENT WITH EXCELLENT SCHOOLS NEARBY AND CLOSE TO NAVIGATION ROAD METROLINK. Hall. Lounge. Ground Floor WC. Dining Breakfast Kitchen. Four Bedrooms. Two Bathrooms. Rear Garden. Driveway. Garage. UNFURNISHED. Available April. MAGNIFICENT TWO DOUBLE BEDROOM SECOND FLOOR APARTMENT LOCATED IN THE HEART OF ALTRINCHAM IN THIS GRADE II LISTED BUILDING WITHIN CLOSE PROXIMITY TO THE ARTISAN MARKET. Communal Entrance. Spacious Living Dining Kitchen. Utility. Modern Bathroom. Two Double Bedrooms. Walk in Wardrobe. UNFURNISHED. Available September. Sorry, No Pets. AN EXCELLENT UPDATED AND EXTENDED TRADITIONAL SEMI DETACHED FAMILY HOME LOCATED WITHIN THE SEMI RURAL VILLAGE OF HIGH LEGH. 1899 sqft. Hall. WC. Two Receptions. Garden Room. Dining Kitchen. Four Bedrooms. Two Bath/Shower Rooms. Principal Bedroom Suite. Garage. Wonderful Gardens. UNFURNISHED. Available January. FULLY RE-DECORATED DETACHED FAMILY HOME ON A PEACEFUL CUL DE SAC IDEAL FOR JOHN LEIGH PARK AND THE TOWN CENTRE. Porch. Hall. Ground Floor WC. Three Receptions. Fabulous Dining Kitchen. Four Bedrooms. Two Bath/Showers. Driveway. Gardens. UNFURNISHED. Available NOW. Minimum 12 month tenancy. A BEAUTIFUL DETACHED FORMER SHOW HOME ON THE POPULAR STAMFORD BROOK DEVELOPMENT CLOSE TO ALTRINCHAM AND THE METROLINK. Hall. Lounge. Dining Room. Kitchen. Utility Room. Ground Floor W.C. Study. Four Double Bedrooms - Ensuite To Principal Bedroom. Bathroom. Rear Garden. Driveway and Garage. Available Mid March. FURNISHED. LOVELY DETACHED FAMILY HOME IN A POPULAR RESIDENTIAL AREA WITH EXCELLENT SCHOOLS NEARBY. Hall. WC. Lounge. Kitchen. Conservatory. Cloakroom. Master Bedroom benefits from a range of fitted furniture and en suite shower room/WC. Three further bedrooms and family bathroom/WC. Externally there is an attached garage and additional parking within the driveway. UNFURNISHED. Available September. AN IMPRESSIVE EXTENDED FOUR BED SEMI-DETACHED WHICH OFFERS EXCELLENT FAMILY ACCOMMODATION WITH THE CATCHMENT AREA FOR BROOKLANDS PRIMARY SCHOOL AND SALE GRAMMAR, WITH WALKING DISTANCE OF THE METROLINK. Hallway. Extended Lounge. Breakfast Kitchen. Bathroom. Office/ Playroom. Four Bedrooms. Family Bathroom. Garden. Driveway. UNFURNISHED. AVAILABLE MID APRIL. A WELL PROPORTIONED THREE BEDROOM SEMI-DETACHED FAMILY HOME LOCATED ON A QUIET CUL DE SAC IN TIMPERLEY. Porch. Ground Floor WC. Live in Dining Room. Breakfast Kitchen. Utility. Landing. Three Bedrooms. Family Bathroom. Garage. UNFURNISHED. Available MAY. A FABULOUS EXTENDED FOUR BEDROOM SEMI-DETACHED FAMILY HOME WITH LARGE REAR GARDENS. Porch. Entrance Hallway. Downstairs WC. Lounge With French Doors to Rear Garden. Second Reception Room with Fitted Units. Large Kitchen/Dining Room With Fitted Appliances. Four Bedrooms. Bathroom With Shower. Garage. FURNISHED. Available Early October. A BEAUTIFULLY APPOINTED, UPDATED AND EXTENDED VICTORIAN END TERRACED IN THIS DESIRABLE LOCATION WALKING DISTANCE OF SCHOOLS AND SHOPS. 1152sqft. Lounge. Open Plan Living/Dining Kitchen. Three Double Bedrooms. Two Bath/Showers. Driveway. West Facing Garden. UNFURNISHED. Available NOW. Minimum 12 month Tenancy. MODERN THREE BEDROOM SEMI-DETACHED AT THE HEAD OF A CUL DE SAC, IDEALLY LOCATED FOR STAMFORD PARK AND SCHOOL. Hall. Lounge. Dining Room. Modern Kitchen. Ground Floor WC. Three Bedrooms. Modern Bathroom. Rear patio with seating area and fantastic garden. UNFURNISHED. Available NOW. A MODERN TOWNHOUSE LOCATED ON A POPULAR DEVELOPMENT. PERFECT FOR ALTRINCHAM TOWN CENTRE AND STAMFORD PARK. Hall. WC Sitting Room. Dining Kitchen. 1st Floor Lounge. Four Bedrooms. Two Bath/Shower, One En Suite. Driveway. Garage. Enclosed Garden. Available NOW. UNFURNISHED. Maximum 6 month tenancy. Sorry, No Pets. A SPACIOUS THREE STOREY HOUSE ON A FANTASTIC GATED DEVELOPMENT WITHIN A MOMENTS WALK OF ALTRINCHAM TOWN CENTRE AND METROLINK STATION. 1200sqft. Hall. WC. Living/Dining Room. Kitchen. Three Bedrooms. Two Bathrooms. Parking. Gardens. UNFURNISHED. Available NOW. A BEAUTIFUL THREE BEDROOM SEM-DETACHED COTTAGE WHICH BENEFITS FROM HAVING VIEWS OVER OPEN COUNTRYSIDE. Porch. Hall. Lounge. Breakfast Kitchen. Conservatory with Office area. Ground Floor WC. Two Double and One Single Bedroom. Family Bathroom. Large Driveway. Gardens. UNFURNISHED. Available NOW. A SUPERB THREE DOUBLE BEDROOM SEMI-DETACHED FAMILY HOME LOCATED ON THIS QUIET ROAD. EXCELLENT LOCAL SCHOOLS NEARBY. Hall. Breakfast Kitchen. Dining Room. Lounge. Three Double Bedrooms. Bathroom. Large Garden. Garage. Driveway with car port. UNFURNISHED. Available NOW. FANTASTIC THREE BED SEMI-DETACHED IDEALLY LOCATED FOR STAMFORD PARK SCHOOL WITH TWO PARKING SPACES. Hall. Lounge. Dining Room. Modern Kitchen. Three Bedrooms. Modern Bathroom. Two Patio with seating area and fantastic garden. UNFURNISHED. Available NOW. A STUNNING MODERN FULLY- REFURBISHED DETACHED THREE BEDROOM FAMILY PROPERTY WITHIN A STONES THROW OF SALE HIGH SCHOOL, GREAT TRANSPORT LINKS AND LOCAL AMENITIES **A MUST SEE PROPERTY**. Hall. WC. Lounge. Dining Room. Kitchen. Three Bedrooms. Bathroom. Large Garden with Decking. Garage. Driveway. AVAILABLE END MARCH. UNFURNISHED. A SUPERBLY PROPORTIONED GROUND FLOOR APARTMENT IN AN EXCLUSIVE DEVELOPMENT OF JUST EIGHT APARTMENTS ON THIS DESIRABLE ROAD. 1122sqft. Hall. Lounge. Dining Room. Breakfast Kitchen. Two Double Bedrooms. Two Bath/Showers. Communal Gardens. FURNISHED. Available August. A STUNNING THREE BEDROOM VICTORIAN TERRACED PROPERTY IN A POPULAR LOCATION IDEAL FOR THE BOLLIN AND BOWDON CHURCH SCHOOLS. Hall. Family Room. Living Room. Large Dining Kitchen. Two Double Bedrooms and a Single Bedroom. Family Bathroom and WC. Garden. Unfurnished. Available NOW. A GOOD SIZED EXTENDED FOUR BED DORMER BUNGALOW SITUATED ON QUITE CUL-DE-SAC IN SALE THIS IS AN IDEAL FAMILY HOME, WITHIN THE CATCHMENT AREA OF TYNTESFIELD PRIMARY SCHOOL AND ALTRINCHAM / SALE GRAMMAR SCHOOL. Porch. Lounge. Breakfast Kitchen. Diing Room. Study. Four Bedrooms. En-Suite. Family Bathroom. Utility. Courtyard Garden. Front Garden. Driveway. PART FURNISHED. AVAILABLE NOW. A STUNNING, COMPREHENSIVELY REFURBISHED, TWO DOUBLE BEDROOMED PERIOD TERRACE WHICH ENJOYS LOVELY VIEWS OVER CROSSFORD BRIDGE PLAYING FIELDS. HIGH SPEC FITTINGS THROUGHOUT. Hall. Lounge. Dining Room. Re fitted Kitchen. Two good Dbl Bedrooms. Walk in wardrobe/store room. Large Bathroom. Landscaped walled courtyard garden. FURNISHED. AVAILABLE END OF APRIL. AN EXCELLENT SIZED THREE BEDROOMED SEMI DETACHED FAMILY HOME ON A POPULAR CUL-DE-SAC LOCATION IN SALE CLOSE TO SEVERAL OF THE IN-DEMAND SCHOOLS INCLUDING TYNTESFIELD PRIMARY. Hall. Lounge. Dining Room. Breakfast Kitchen. Three Bedrooms. Family Bathroom. Driveway. Garage. Garden. AVAILABLE NOW. PART FURNISHED. AN EXTENDED THREE BED SEMI-DETACHED PROPERTY IN A POPULAR RESIDENTIAL LOCATION CLOSE TO SEVERAL LOCAL SCHOOLS AND WITHIN AN EASY REACH OF TIMPERLEY METROLINK STATION. Porch. Hall. Lounge. Spacious Dining Kitchen. Ground Floor WC. Three Bedrooms. Family Bathroom. UNFURNISHED. Available MAY. A FANTASTIC RECENTLY REDECORATED THREE BEDROOM TERRACE PROPERTY CONVENIENTLY LOCATED NEAR CHORLTON TOWN CENTRE AND THE METROLINK. Hall. Lounge. Dining Room. Breakfast Kitchen. Two Double Bedrooms. One Single Bedroom. Family Bathroom. Garden. UNFURNISHED. Available NOW. AVAILABLE EARLY APRIL. No Pets. No Sharers. A LOVELY THREE BEDROOM SEMI-DETACHED WITHIN CLOSE PROXIMITY TO NAVIGATION ROAD METROLINK STATION AND EXCELLENT LOCAL SCHOOLS. Porch. Hall. Lounge. Dining Room. Conservatory. Kitchen. Three Bedrooms. Family Bathroom. Corner plot with garden. Parking for 2 cars. UNFURNISHED. Available Now. A SUPERB TWO BEDROOM PERIOD TERRACE WITHIN WALKING DISTANCE OF BOWDON CRICKET CLUB AND LOCAL AMENITIES. Hallway. Lounge. Kitchen. Courtyard Graden. Master Bedroom. Second Double Bedroom. Large Bathroom. PART FURNISHED. Available Early November. A BEAUTIFUL THREE BEDROOM TWO BATHROOM PENTHOUSE APARTMENT WITHIN WALKING DISTANCE OF HALE VILLAGE. Communal Entrance and Hall. Spacious Lounge. Breakfast Kitchen. Two Bathrooms. Three bedrooms. Utility Room. Balcony. Communal Gardens. Garage. UNFURNISHED. Available NOW. AN ATTRACTIVE END TERRACED HOME WITH OFF ROAD PARKING AND DELIGHTFUL SUNNY ASPECT GARDEN IN A POPULAR LOCATION. Hall. Lounge. 12' Dining Room. 14' Breakfast Kitchen. Two Double Bedrooms. Spacious Bathroom. Driveway. Gardens. UNFURNISHED. Available NOW. A WELL PRESENTED BAY FRONTED TERRACED ON THE POPULAR 'B' STREETS WALKING DISTANCE OF HALE AND ALTRINCHAM. 1030sqft. Hall. Lounge. Dining Room. Kitchen. Two Double Bedrooms. Bathroom. Cellars. West Facing. Courtyard. Permit Parking. Available May. UNFURNISHED. A RECENTLY REFURBISHED THREE BEDROOM SEMI-DETACHED FAMILY HOME WITH SOUTH FACING GARDEN WITHIN WALKING DISTANCE OF THE WELL GREEN SCHOOL. Hall. Open Plan Living Dining Kitchen. Three Bedrooms. Moden Family Bathroom. Front and Rear Gardens. UNFURNISHED. Available NOW. A WELL APPOINTED, SUPERBLY LOCATED VICTORIAN TERRACE IDEAL FOR THE TOWN CENTRE, METRO, MARKET QUARTER, STAMFORD PARK AND SCHOOL. 782sqft. Lounge. Dining Room. Kitchen. Two Bedrooms. Bathroom. Courtyard Garden. On Street Parking. FURNISHED. Available NOW. A STYLISH PERIOD TERRACED PROPERTY WITH WEST FACING GARDEN AND PARKING, IN A POPULAR LOCATION WALKING DISTANCE TO LOCAL SHOPS. Lounge. Dining Room. Kitchen. Ground Floor WC. Two Double Bedrooms. Bathroom. Driveway. Garden. UNFURNISHED. Available April. A CHARMING THREE BEDROOM SEMI-DETACHED WITH EXCELLENT LOCAL SCHOOLS NEARBY AND WITHIN WALKING DISTANCE OF JOHN LEIGH PARK AND ALTRINCHAM TOWN CENTRE. Entrance Hall. Living Room. Dining Room. Kitchen. Three Bedrooms. NEW Bathroom with Separate WC. Garage. Garden. UNFURNISHED. Available NOW. POPULAR THREE BEDROOM SEMI-DETACHED CONVENIENTLY LOCATED WITHIN WALKING DISTANCE OF THE METROLINK, TIMPERLEY TOWN CENTRE AND LOCAL AMENITIES. Hall. Lounge. DIning Room. Kitchen. Two Double Bedrooms, One Single Bedroom. Bathroom. Garage. UNFURNISHED. Available NOW. A SPACIOUS MODERN TWO BED TERRACE PROPERTY WITHIN CLOSE PROXIMITY TO STAMFORD PARK AND ALTRINCHAM TOWN CENTRE. Hallway. Lounge with wood burner. Dining area. Kitchen. Courtyard Garden. Two Double Bedrooms. Stylish Bathroom. FURNISHED. Available from 27th October. A LOVELY TWO BEDROOM BAY FRONTED TERRACE PROPERTY LOCATED ON THE POPULAR 'B' STREETS. Hallway. Through Lounge/Dining Room. Kitchen. Door To Cellars. Two Double Bedrooms. Modern Bathroom with Shower. Small Garden to Front and Courtyard to Rear. PART FURNISHED. Available NOW. A STUNNING GROUND FLOOR APARTMENT OVERLOOKING COMMUNAL GARDENS IN A GATED DEVELOPMENT WITHIN A MOMENTS WALK OF HALE VILLAGE . 639 sqft. Hall. 17' Living/Dining Room. Two Bedrooms. Two Bath/Showers. Undercroft Parking. Gardens. FURNISHED. Available Early MAY. AN OUTSTANDING GROUND FLOOR TWO BEDROOM TWO BATH APARTMENT LOCATED IN THIS POPULAR DEVELOPMENT CLOSE TO HALE VILLAGE. Communal Entrance. Hall. Living/Dining Room. Kitchen. Two Bedrooms. Two Baths/Showers. Communal Lift. Undercroft Parking. Outside Seating Area. UNFURNISHED. Available Early MAY. LUXURY TWO BEDROOM TWO BATHROOM THIRD FLOOR APARTMENT IN THE HEART OF ALTRINCHAM TOWN CENTRE. Situated in a Redeveloped Listed Edwardian Building, the Property Comprises: Open Plan Lounge/Kitchen Diner with Intergrated Appliances. Two Double Bedrooms. Two Bathrooms. One parking space. UNFURNISHED. Available NOW. 12 Month minimum contract. BEAUTIFUL ONE DOUBLE BEDROOM SECOND FLOOR APARTMENT LOCATED IN THE HEART OF ALTRINCHAM IN THIS GRADE II LISTED BUILDING WITHIN CLOSE PROXIMITY TO THE ARTISAN MARKET. Communal Entrance. Dining Kitchen. Lounge. Modern Shower Room. One Double Bedroom. UNFURNISHED. Available September. Sorry, No Pets. FULLY RE-DECORATED TWO BEDROOM TERRACE WITHIN WALKING DISTANCE OF ALTRINCHAM TOWN CENTRE AND METROLINK STATION. Hall. Lounge. Dining Room. Kitchen. Landing. Two Double Bedrooms. Bathoom with separate shower. Rear Courtyard. Permit Parking. UNFURNISHED. Available NOW. A WONDERFUL TWO DOUBLE BEDROOM TERRACE PROPERTY WHICH BENEFITS FROM BEING CLOSE TO BOTH HALE VILLAGE AND ALTRINCHAM TOWN CENTRE. Hall. Lounge. Dining Room. Kitchen. Two Double Bedrooms. Bathroom. Rear Courtyard and Garden. UNFURNISHED. Available NOW. **MUST SEE PROPERTY** THIS STUNNING TWO BED TERRACE PROPERTY HAS BEEN FULLY RENOVATED THROUGHOUT INCLUDING A NEW KITCHEN, BATHROOM, ALARM SYSTEM AND PARKING, BOOK IN A VIEWING TODAY TO AVOID DISAPPOINTMENT. Porch. Hall. Lounge. Breakfast Kitchen. Three Bedrooms. Garden. Parking. UNFURNISHED. AVAILABLE NOW. No Pets. 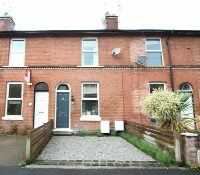 AN IDEALLY POSITIONED, PERIOD TERRACED WITHIN A MOMENTS WALK OF ALTRINCHAM TOWN CENTRE AND METRO. 802sqft. Hall. 24' Living/Dining Room. 13' Kitchen. Two Double Bedrooms. 14' Principal Bedroom. Bathroom. Courtyard Garden. Permit Parking. UNFURNISHED. Available NOW. Sorry, No Pets. A RECENTLY RENOVATED TWO BEDROOM TERRACED PROPERTY IN A VERY CONVENIENT LOCATION WITHIN WALKING DISTANCE OF NAVIGATION RD METROLINK. Hall. Lounge. Dining Room. Breakfast Kitchen. Two Double Bedrooms. Modern Bathroom. Courtyard Garden. Permit Parking. UNFURNISHED. Available NOW. AN ATTRACTIVE VICTORIAN PROPERTY IDEALLY POSITIONED WITHIN WALKING DISTANCE OF THE NAVIGATION ROAD METROLINK AND ALTRINCHAM. Hall. Lounge. Dining Kitchen with appliances. Two Double Bedrooms. Bathroom. Rear Garden. Permit Parking. UNFURNISHED. Available NOW. LOVELY REFURBISHED TERRACED PROPERTY LOCATED WITHIN CLOSE PROXIMITY OF OLDFIELD BROW PRIMARY SCHOOL AND DUNHAM PARK. Hall. Living Room. Fitted Dining Kitchen. Ground Floor WC. Family Bathroom. Three Bedrooms. Rear Garden. Driveway. UNFURNISHED. Available NOW. ***A MUST SEE PROPERTY***A STUNNING TWO BED MODERN PENTHOUSE APARTMENT ON THE THIRD FLOOR OF THIS EXCLUSIVE DEVELOPMENT IN THE HEART OF SALE TOWN CENTRE WITHG PARKING. Communal Entrance. Hall. Lounge. Kitchen. Two Double Bedrooms. En-Suite. Family Bathroom. Balcony. Parking. FURNISHED. AVAILABLE NOW. AN IMMACULATE TWO BEDROOM FIFTH FLOOR APARTMENT IN THIS STUNNING AND POPULAR CANAL SIDE URBAN SPLASH DEVELOPMENT. Private Balcony. Hall. Lounge. Breakfast Kitchen. Two Bedrooms. One Bathroom plus One En-suite. Underground Parking. FURNISHED. Available NOW. A WELL PRESENTED TWO BEDROOM PERIOD END COTTAGE IN A FANTASTIC LOCATION WITHIN WALKING DISTANCE OF TIMPERLEY VILLAGE. Approx 850sqft. Entrance Porch. Open plan Living/Dining Room. Kitchen. Two excellent Double Bedrooms. Bathroom. Gardens. FURNISHED. Available Early JUNE. AN INCREDIBLE TWO BED APARTMENT LOCATED IN THE HEART OF ALTRINCHAM CENTRE. Situated in a Redeveloped Listed Edwardian Building, the Property Comprises: Open Plan Lounge/Kitchen Diner with Intergrated Appliances. Two Double Bedrooms. Bathroom With Shower. One parking space. Lift. Available NOW. 12 Months Minimum Contract. LUXURY TWO BEDROOM ONE BATHROOM APARTMENT IN THE HEART OF ALTRINCHAM TOWN CENTRE. Situated in a Redeveloped Listed Edwardian Building, the Property Comprises: Living Dining Room and Seperate Kitchen with Intergrated Appliances. Two Double Bedrooms. One Bathroom. One parking space. UNFURNISHED. Available NOW. 12 months minimum contract. CONTACT HALE RENTALS 0161 941 6767. POPULAR TWO BEDROOM ONE BATHROOM APARTMENT IN THE HEART OF ALTRINCHAM TOWN CENTRE. Situated in a Redeveloped Listed Edwardian Building, the Property Comprises: Living Dining Room and Seperate Kitchen with Intergrated Appliances. Two Double Bedrooms. One Bathroom. Off Road Parking. UNFURNISHED. Available NOW. Minimum 12 month tenancy. AN AMAZING TWO BEDROOM TWO BATHROOM APARTMENT WITHIN WALKING DISTANCE OF NAVIGATION ROAD METROLINK AND ALTRINCHAM TOWN CENTRE. Communal Entrance andl Hall with Lift. Spacious Living Dining Room. Kitchen. Two Double Bedrooms. Bathroom plus En-Suite. Parking. UNFURNISHED. Available NOW. A STUNNING LARGE TOP FLOOR MODERN APARTMENT WITH PARKING, WITHIN WALKING DISTANCE OF BOTH SALE TOWN CENTRE AND SALE MOOR. GREAT TRANSPORT LINKS NEARBY SUCH AS SALE METROLINK AND WITHIN THE CATCHMENT AREA FOR A NUMBER OF SOUGHT AFTER SCHOOLS. Communal Entrance. Lift. Hallway. Lounge. Kitchen. Bathroom . Two Double Bedrooms. En-Suite. Off Street Parking. AVAILABLE MID FEB. UNFURNISHED. LOVELY TWO BEDROOM GROUND FLOOR APARTMENT IN THIS POPULAR DEVELOPMENT WITHIN WALKING DISTANCE OF ALTRINCHAM TOWN CENTRE, METROLINK AND STAMFORD PARK. Open plan Living / Dining Room. Kitchen with appliances. Two Bedrooms. Bathroom. Parking. FURNISHED. Available NOW. A FABULOUS TWO BEDROOM THIRD FLOOR APARTMENT IN THE STUNNING CANAL SIDE 'BUDENBERG HAUS PROJEKTE' BY URBAN SPLASH. Ultra Contemporary Design. Private Balcony facing the Communal Gardens. Lounge with Vaulted Ceiling. Kitchen. Two Bedrooms. Bathroom. FURNISHED. One parking space. Available End of March. Minimum 12 month tenancy. A STYLISH MODERN TWO BEDROOM FIRST FLOOR APARTMENT WITHIN THIS POPULAR DEVELOPMENT WITHIN WALKING DISTANCE OF ALTRINCHAM TOWN CENTRE. Parking space included! Hall. Lounge. Dining Kitchen with built in appliances and space for table. Bathroom. One Parking Space. UNFURNISHED. Available NOW. Sorry, No Pets. A LOVELY TWO BEDROOM TWO BATHROOM APARTMENT WITHIN WALKING DISTANCE OF NAVIGATION ROAD METROLINK AND ALTRINCHAM TOWN CENTRE. Communal Entrance andl Hall with Lift. Spacious Living Dining Room. Kitchen. Two Double Bedrooms. Bathroom plus En-Suite. Parking. UNFURNISHED. Available NOW. A STYLISH TWO BEDROOM APARTMENT IN THE STUNNING CANAL SIDE 'BUDENBERG HAUS PROJEKTE' BY URBAN SPLASH. Ultra contemporary design. Private West Facing Balcony. Lounge. Kitchen. Two Bedrooms. Bathroom. Underground Parking. FURNISHED. Available August. A LOVELY TWO BEDROOM FIRST FLOOR APARTMENT LOCATED ON A QUIET CUL DE SAC WITHIN THE POPULAR STAMFORD BROOK DEVELOPMENT. Communal Entrance and Hall. Open plan Living Dining Kitchen. Two Double Bedrooms. Bathroom. Parking. FURNISHED. Available NOW. A SUPERBLY PROPORTIONED FIRST FLOOR APARTMENT IN THIS POPULAR AND GATED DEVELOPMENT IN HALE. Communal Hall and Landing. Hall. Living/Dining Room. Kitchen with appliances. Two Bedrooms. Two Baths/Showers. Parking. Communal Gardens. Lift. UNFURNISHED. Available NOW. MODERN GROUND FLOOR APARTMENT IN ALTRINCHAM WITH PRIVATE GATED PARKING WITHIN WALKING DISTANCE TO NAVIGATION METROLINK STATION. Communal Entrance and Hall. One Double Bedroom. Living Dining Kitchen. Modern Bathroom. One parking space. FURNISHED. Available 1st May. Minimum 12 month contract. A LOVELY TWO BEDROOM GROUND FLOOR APARTMENT LOCATED ON A QUIET CUL DE SAC WITHIN THE POPULAR STAMFORD BROOK DEVELOPMENT. Communal Entrance and Hall. Open plan Living Dining Kitchen. Two Double Bedrooms. Bathroom. Parking. UNFURNISHED. Available Mid-November. LARGE RECENTLY RE-DECORATED ONE DOUBLE BEDROOM FIRST FLOOR APARTMENT IN A VICTORIAN SEMI DETACHED WITH A LOVELY COMMUNAL SOUTH FACING GARDEN. Communal Entrance and Hall. Living Room. Dining Room. One Large Bedroom. Shower Room. Parking for one car. Communal Garden. UNFURNISHED. Available NOW. Sorry, No Pets. A FIRST FLOOR APARTMENT WITH WEST FACING BALCONY AND UNDERCROFT PARKING IN THE STRIKING BUDENBERG DEVELOPMENT WALKING DISTANCE TO METRO. Hall. Living/Dining Room. Kitchen. Two Bedrooms. Bathroom. 16' Balcony Area. Communal Gardens. Lift. UNFURNISHED. Available NOW. MODERN ONE DOUBLE BEDROOM LUXURY APARTMENT IN THE CENTRE OF HALE BARNS WITH OFF STREET PARKING. Communal Entrance. Communal Hall. Open Plan Living Dining Kitchen. Double Bedroom. Bathroom. Available NOW. UNFURNISHED. A LOVELY SIZED LIGHT FIRST FLOOR APARTMENT WITH OFF STREET PARKING WITHIN THE HEART OF SALE WITHIN WALKING DISTANCE TO SALE METROLINK AND TOWN CENTRE. Communal Entrance. Hallway. Bathroom. Lounge Diner. Kitchen. Large Double Bedroom. Communal Garden. Parking. AVAILABLE NOW. FURNISHED. A SUPERB ONE BEDROOMED GROUND FLOOR APARTMENT WITHIN THIS FABULOUS GATED DEVELOPMENT. ALLOCATED PARKING. DECKED PATIO AREA. HUGELY POPULAR 'SPORT CITY' LOCATION. Hall. Lounge with patio doors onto decked area. Kitchen. Double Bedroom. Bathroom. Parking with gated carpark. Available February. UNFURNISHED. A FABULOUS SECOND FLOOR APARTMENT ENJOYING A GREAT LOCATION IN THE HEART OF HEATON MOOR AND WITHIN WALKING DISTANCE OF SHOPS AND BARS. Large Bright Lounge/Dining Room. Kitchen Includes Washer Dryer & Fridge Freezer. One Large Bedroom. Bathroom with White Suite and Shower. Communal Gardens. RECENTLY FURNISHED & AVAILABLE FROM FEBRUARY 22nd. A MODERN SECOND FLOOR STUDIO APARTMENT IN THE HEART OF ALTRINCHAM TOWN CENTRE CLOSE TO ALTRINCHAM METROLINK STATION AND ARTISAN MARKET. Communal Entrance and Hall. Living/Dining Area. Kitchen area with intergrated appliances. Modern Bathroom. UNFURNISHED. Available NOW. A GOOD SIZED MODERN ONE BED APARTMENT ON THE SECOND FLOOR OF THIS PERIOD CONVERSION WITHIN WALKING DISTANCE OF SALE METRO STATION AND SALE TOWN CENTRE, A MUST SEE PROPERTY.Hallway. Lounge. Double Bedroom. Bathroom. Parking. Communal Gardens. UNFURNISHED. AVAILABLE EARLY FEB.
A FIRST FLOOR ONE DOUBLE BEDROOM APARTMENT ABOVE A COMMERCIAL UNIT RIGHT IN THE HEART OF ALTRINCHAM TOWN CENTRE AND CLOSE TO THE ARTISAN MARKET. Own Entrance. Hall. Lounge. Kitchen with appliances. Double Bedroom. Bathroom. FURNISHED. NO parking included. Tax Band A. Available Early DECEMBER. Sorry, No DSS or Pets. A SUPERBLY PROPORTIONED TWO DOUBLE BEDROOMED FIRST FLOOR APARTMENT IDEALLY LOCATED IN THE CENTRE OF ASHTON VILLAGE WITHIN WALKING DISTANCE OF SALE TOWN CENTRE WITH AMENITIES THEY HAVE TO OFFER AT YOUR FINGERTIPS. Hall. Good Sized Lounge. Modern Kitchen. Two good-sized Bedrooms. Contemporary Bathroom. UNFURNISHED. AVAILABLE NOW.